We’re getting so much love over on Pinterest, that we thought we’d write about it here. On our website, we like to demonstrate our before and after transformation abilities, but on Pinterest we just showcase our finished work. One photo in particular is really hitting the mark with pinners. Our #Dulux Chic Shadow in a lovely matt finish pin is repinned multiple times a week onto other people’s inspiration boards. We’ve done a few jobs in Dulux Chic Shadow (both at the home-owner’s request and from our recommendations) and we’re actually painting another hallway with it this week. It’s definitely a popular colour and we enjoy working with it. 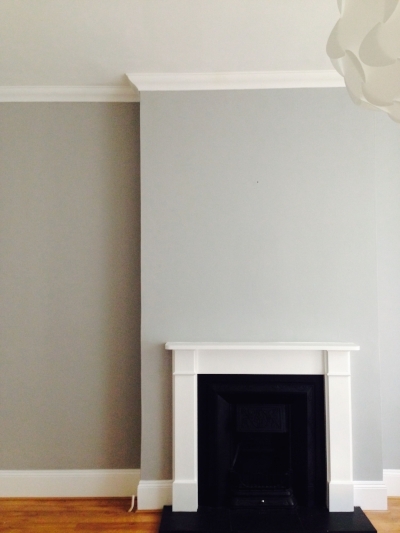 We like to accent it with a classic white satinwood, as we did for the mantlepiece and skirting shown in the image, but it works well with darker and bolder contrasts too. So, thanks Dulux and thanks Pinterest! Want some Chic Shadow in your home? We’d love to help! Get in touch here.